TORONTO – Actor Seth Rogen and screenwriter Evan Goldberg are teaming up with Canopy Growth Corp. to launch a cannabis brand called Houseplant. The Vancouver-born star of Pineapple Express and the Canadian screenwriter, with whom Rogen collaborated on the stoner film, are co-founders of the Toronto-based company. Houseplant says Canopy has acquired 25% of the Toronto-based business and invested working capital, but wouldn’t disclose any further financial information. Canopy in its role as venture partner is providing the facilities, expertise, and infrastructure to produce the cannabis. 19 March 2019, London: EMMAC, the European independent medical cannabis company, is pleased to announce that Medalchemy, EMMAC’s fully-licensed GMP certified laboratory in Alicante, Spain, has secured approval from the Spanish Health Authorities AEMPS to import medical cannabis for scientific research. This landmark announcement places Medalchemy at the forefront of medical cannabis research in Spain, and ensures EMMAC is well positioned to capitalise on anticipated regulatory changes, as demand for premium quality medical cannabis grows in Spain and across Europe. With over a decade of experience in the research, development and manufacture of active pharmaceutical ingredients (APIs), Medalchemy is an important part of EMMAC’s pan-European research and development initiative to allow the production, registration and exportation of GMP-certified cannabinoid-based APIs. Antonio Costanzo, the former Head of Public Policy and Government Relations at Uber is taking a punt on CBD. Costanzo, now CEO at London-based EMMAC Life Sciences Ltd. told Bloomberg his company is attempting to negotiate the various EU member state market rules when it comes to the substance, through a very defined strategy. That strategy is to try to build a “single market” for medicinal cannabis, including CBD, by investing in businesses in larger European countries that are liberalizing their way toward making it a mainstream product. “Governments are opening up at a speed that it is hard to keep up with,” Costanzo said, and the company’s backers have been pleasantly surprised at interest in their offering. 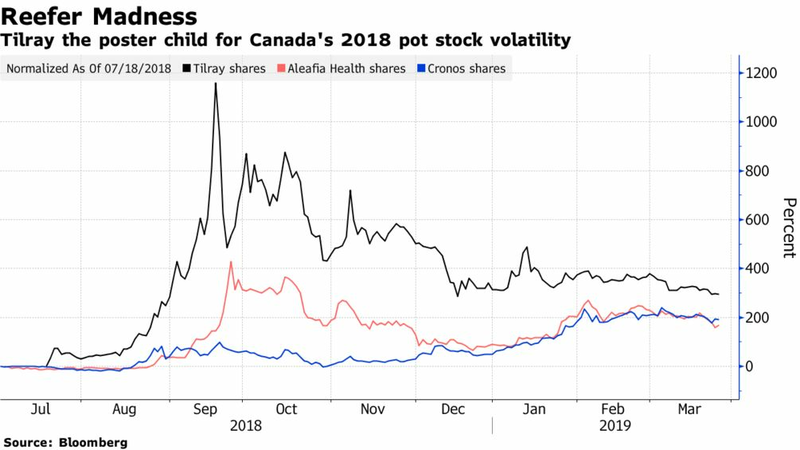 The frenzy in Canadian pot stocks has created plenty of opportunities for short-term traders. That kind of volatility holds no attraction for one European medical cannabis company. Grow Biotech, which advises medical-cannabis producers on their operations, has just kicked off a private fundraising round and has pushed back plans for a stock-market listing in London that had been penciled in for late this year. The company raised 4 million pounds in 2018 and says it’s targeting investors in its new fundraising round who are already involved in North American cannabis. This makes for easier conversations than attempting to persuade fund managers with no experience of the market that medical cannabis is a legitimate industry, according to Grow Biotech. Pot stocks in Canada boomed in 2018 with valuations soaring ahead of the eventual legalization of recreational marijuana in October. That created some behemoths of the industry, at least in terms of market value, and came with a side of rampant volatility. Canopy Growth Corp., for example, has a market capitalization of about $14.5 billion on 2018 revenue of $61 million. Investors haven’t been discerning enough in choosing between North American pot companies that have fundamental value and those that are just out to “ride the wave,” said Langley. That means all cannabis stocks are rolled into a single group and move as one, even if all aren’t created equal, he said. Us too, a fantastic boost to a huge amount to the populations quality of life!